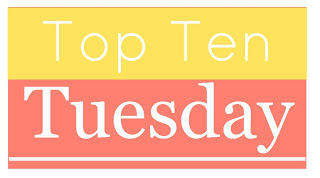 Okay, so today's Top Ten Tuesday was the top ten things you love about blogging, but I feel like I've written similar lists a lot recently, so I decided to come up with my own list. Hope you like it! These are the things that get me interested enough to pick up a book - or at least take a closer look! The cover - Okay, I know they say not to judge a book by its cover, but I totally do. Probably the biggest thing that initially draws me to a book is its cover. I love pretty or striking covers - lots of color also draws me in. The blurb - Well, this seems obvious, but I do have to come up with ten of these. Not only does the book have to sound like something I'd like, but a well-written blurb is a big factor in whether or not I add a book to my TBR list - especially when the book is self-published. If there are lots of errors in the blurb or it's not worded well, I assume the book will be the same and I take a pass. The author - If the book is by an author I love or by someone that I've heard raves about, then I'm willing to give a book a try when I might not have otherwise. The reviews - Again, this seems obvious - after all, I am a book blogger! Often there are books that I wouldn't have even considered picking up, but then I read an amazing review and I just have to read it! The Goodreads rating - If I'm thinking about reading a book, I'll often glance at the rating on Goodreads. If the overall rating is 4 or above, I assume it's a pretty good bet. If it's lower than 3.5 I proceed with caution. The number of reviews also makes a big difference. If a book has five stars, but only 10 ratings, I'll take a look and see if the ratings look like they're from the author's best friends or from bloggers or other reputable sources. The negative reviews - This might sound odd, but I often feel like I can learn just as much about a book from a negative review as I can from a positive one. Sometimes things that really bother some reviewers aren't much of an issue for me (such as someone who gets upset when the main female character isn't strong and empowered - not saying that I don't like those kinds of female characters, but it's not always an automatic negative for me when the main character is a bit more timid). By reading the negative reviews I can get a feeling for whether or not the things that people really disliked about the book are things that would really bother me as well. A unique premise - When I find a book that seems very unique, I'm drawn to it. Similarly, if the book seems extremely cool in some way, I'm definitely more apt to pick it up. For Christmas, I asked for (and received) S, which was created by JJ Abrams. The book looks like an old library book and has a ton of notes, photographs, postcards, etc in it that lead you toward the answer to a central mystery. I don't even know if I'm going to love the story, but the concept was so cool and the book was so unique that I just had to have it! The genre - I'm definitely drawn to books that fall into the paranormal or dystopian categories. Fantasy also catches my interest and occasionally sci-fi. Contemporary romances are another genre that I will pick up - especially YA. The buzz - Let's face it, marketing works - the more I see a book around the blogosphere, the more likely I am to check it out. Sometimes I'll pass a book up the first few times I see it, but then, after seeing it around a lot, I'll think, "Well, I guess I have to at least check that book out." So, what draws you in and makes you decide to add a book to your TBR, buy it, or even just check it out? I so agree with your list - I really rely on Goodreads before I start reading! I like how you picked your own topic heh :) I just tend to skip that week's meme topic if I've recently posted a similar post. Those are good things to look for when thinking about a book. I definitely read negative reviews prior to making a decision. Awesome list! The negative reviews and the buzz definitely influence whether I pick up a book or not. Obviously if it's a premise or genre I'm not interested in, it won't make much of a difference, but if I'm on the fence, I definitely weigh in other people's reviews.